Social media marketing should be a part of your overall marketing plan. The social channel can send a torrent of targeted, engaged traffic to your site. It can give your brand more exposure to new audiences. And it can improve your existing customers’ brand loyalty. The result? More leads, more conversions and more sales. Let’s say, however, that you’re dead set against enjoying the benefits of integrating social media into your site. You don’t want the referrals from Facebook and Twitter. And you couldn’t care less about audience engagement on Instagram and Pinterest. I’m going to show you how to turn off these valuable traffic spigots. Below, you’ll learn a set of tactics that all but ensure you’ll receive a drop of love from the social channel. You’ve written a great piece of content. You know your audience will love it. In fact, it’s so good they’ll likely tell their friends about it. To make sure no one hears about your content on Facebook or Twitter, refrain from putting social share buttons near its end. You can’t trust visitors to not share your content. It’s just that good, but you can remove the temptation by neglecting to give them share buttons that make sharing easy. The last thing you want is for your customers and prospects to find you on Facebook, Twitter and Instagram. After all, that would just lead to more social media referrals, the exact outcome you’re trying to avoid. Make it tough for folks to find you by refusing to put social media profile icons on your site. If you must include them – for example, your board of directors demands it – place them where visitors are unlikely to see them. Definitely don’t place them in your footer near your phone number and email address. That’s the first place your visitors will look. Suppose you’re active on Facebook and Twitter, but don’t want your profiles connected to your company’s site. After all, that would allow your worlds to collide. It wouldn’t be long before fans in the social channel strolled over to your website. And that, as we’ve noted, is unacceptable. Make sure there’s no indication that your website is in any way linked to your social media profiles. Definitely don’t embed your Twitter feed, Pinterest feed and Instagram gallery in your site’s right sidebar. And whatever you do, don’t put a Facebook Like Box there. People might get the idea that others trust your company, are loyal to your brand and love doing business with you. If you must integrate social media into your site – again, if your board of directors is calling the shots – you can at least take a hands-off approach to dilute its effect. How do you do that? First, don’t set up a Web analytics package. That would just allow you to track how social media referrals behave when they arrive on your site. That knowledge might inadvertently lead to improved conversions. And we don’t want that. Second, don’t monitor which social media sites are sending you the most traffic. Doing so would only tempt you to focus your efforts on maximizing your footprint on those sites. It’s far better to act like an ostrich and keep your head buried in the sand. In the event you’ve been given a mandate to leverage the social channel for your company, there’s one more tactic you can use to dampen referral volume. Create profiles on every social media site you can find. Don’t focus on the largest sites. That would just bring more traffic. Instead, throw a wide net that snags even the smallest sites, including those unlikely to send you any referrals at all. Clearly, I wrote this blog with tongue firmly planted in cheek. You already know how important social media can be for generating awareness for your brand, encouraging customer loyalty and improving brand engagement. It can – and should – play a key role in your inbound marketing strategy. The social channel is going to be more important than ever in 2016. Make sure your site is optimized for it to give yourself an advantage over your less-prepared competition. Raritan Engineering Company your marine sanitation device experts would like to share with you these topics we thought would be of interest to you this month regarding safe boating tips. Your marine sanitation device professionals know that you’ve intended to sign up for the United States Power Squadrons safe-boating course for a while now, but the kids’ soccer practice always conflicts with the dates. You left the dock well before dawn on an offshore trip to fish the Canyons. Your boat’s radar is working properly, but according to rule 6, Safe Speed, a vessel must be operated at a safe speed to avoid collision, with the operator taking into account visibility, traffic density, stopping distance, background lights, sea conditions, navigational hazards and the boat’s draft. Your marine sanitation device experts know that to get to your favorite bay, you have to run a lengthy well-marked channel. As you do, another boat approaches rapidly from the opposite direction. In this event, you should refer to rule 14, which states that two power-driven boats meeting on reciprocal courses with a risk of collision shall each alter course to starboard to pass on the port side of the other. Go to http://raritaneng.com/catagory-pages/sanitation-accessories/ and see how you can find more information as well as get assistance on marine sanitation device and on safe boating tips at Raritan Engineering. You are sharking at night, anchored, when you see a larger vessel making way, approaching well off your port side. You can clearly see a red all-round light on top and a lower white light in a vertical line, another white light in the direction of outlying gear, sidelights and a stern light. This means the vessel is a fishing boat engaged in fishing other than trawling. While kingfishing in the Gulf of Mexico around some oil rigs, you spot a nearby commercial boat barely moving. Under Rule 3, General Definitions, any of the following conditions would qualify a vessel as restricted in maneuverability: It is engaged in laying, servicing or picking up a pipeline; it is engaged in dredging, surveying or underwater operations; it is engaged in replenishment or transferring people, provisions or cargo. One of the engines on your twinoutboard center console overheated, and you are idling back to the marina. As you transit the narrow channel of a coastal river, a commercial vessel comes up behind you and sounds two prolonged blasts of the horn, followed by two short blasts. This signals its intention to overtake you on your port side. Running to your favorite redfish hole involves crossing a congested bay with several marinas. In this situation you are required to avoid an anchored freighter with no one aboard and a sailboat underway. So don’t forget these situations to be aware of when maintaining safe boating. 1) You left the dock well before dawn on an offshore trip to fish the Canyons. Your boat’s radar is working properly, but according to rule 6, Safe Speed, a vessel must be operated at a safe speed to avoid collision, with the operator taking into account visibility, traffic density, stopping distance, background lights, sea conditions, navigational hazards and the boat’s draft; and 2) during a sailfish tournament, you are trolling off Miami’s government cut when a commercial freighter comes into view, heading toward your boat on an apparent collision course. In this instance, the vessel to starboard has the right of way. Click here and see how Raritan Engineering has more information on marine sanitation device and on how to maintain safe boating. Stainless Marine your marine boat parts professionals would like to share with you these topics we thought would be of interest to you this month regarding getting the scoop on personal rescue beacons. Personal rescue beacons are increasingly finding their way into anglers’ tackle bags, and for many it’s not only for the ability of the devices to effect an emergency rescue, but also for their expanding role as communication devices. One of the first of these devices to catch on with fishermen was the SPOT Satellite GPS Messenger. Along with an SOS button (which contacts the GEOS International Emergency Response Coordination Center to initiate a rescue), this robust little package features the ability to send a couple of preconfigured emails. All messages arrive in a predetermined recipient’s email, and the current location is posted on a map located on findmespot.com, where the user, device and friends are all registered. “Because it is a communicator, people take it along and use it, whereas with a personal locator beacon, the owner may never have to use it,” says Rich Galasso, Southeast distribution manager for SPOT. SPOT’s tracking feature, which updates your location on the website map, has a lot to do with its popularity. Your Group #24 battery box experts know that the newest iteration, SPOT GEN3 ($149.95), has the standard features, with the addition of adjustable tracking, which posts a new position every 60, 50, 30, 10, 5 or 2½ minutes, and a motion sensor that suspends tracking when the device senses it’s no longer moving, and restarts once you get going again. You can find more information as well as get assistance on group #24 battery box and the scoop on personal rescue beacon upgrades at Stainless Marine. Enhanced communications are ­available with the SPOT Connect ($169.99), which links via Bluetooth to a smartphone or pad, from which you manage custom and ­preconfigured texts and emails. “It’s SPOT on s­teroids,” says Galasso. 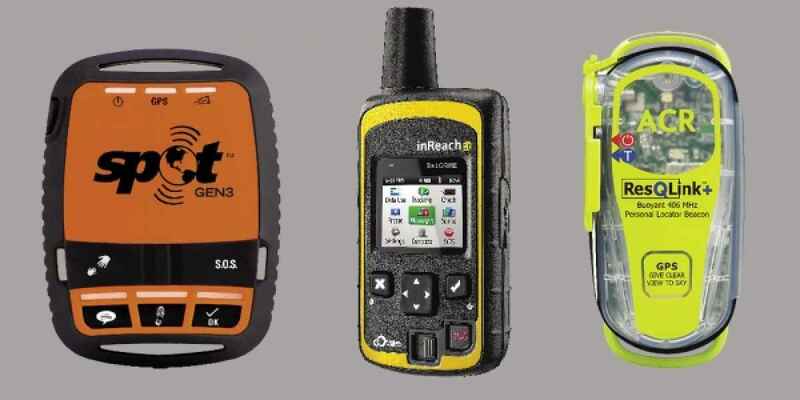 Moving into the realm of ­two-way communications is DeLorme’s ­inReachSE ($299), which now has a color screen, virtual keyboard, and the ability to cache and display NOAA charts downloaded from the Earthmate App for smartphones and tablets. But the interactive and social ­networking is just as big of a draw. inReachSE also has a website component, MapShare (mapshare.delorme.com), which allows others to follow a trip through the tracking feature, and even ping the location of the device. As with the SPOT, a service plan is required. Annual plans start at basic SOS service for $9.95 a month, and top out at $65 a month for a full-service, four-month seasonal plan, with varying levels of feature activation ­available in between. While it’s a different class of device, even the venerable personal locator ­beacon — in particular the ResQLink+ from ACR Electronics — has taken on some aspects of a communicator, though there are notable differences in function from the DeLorme and SPOT ­devices. ResQLink does offer a function that allows you to test the 406 mHz emergency transmitter and the integral GPS, and send a position via text or email to yourself and up to five other recipients. To activate the modified test function and take advantage of its capabilities requires registration with an online service, 406Link.com. The 406Link.com account monitors and records the tests, as well as battery life remaining on your PLB. Standard 406Link.com service, at $39.95 a year, allows for standard self-tests (no GPS), and sends results to you and one other address. The Plus level allows for multiple recipients and GPS through-satellite tests for $59.95 a year. Stainless Marine your marine boat parts experts would like to share with you these topics we thought would be of interest to you this month regarding how to protect your fuel system. Your marine boat parts specialist knows that your first question might be what the heck is diurnal? We’re talking about fuel evaporative emissions that occur as a result of venting fuel-tank vapors during daily temperature changes while the engine is not even running. Emissions, yes; not engine exhaust. You aren’t going to have to do much of anything with your existing boat until you need to replace fuel lines. There has been a gradual phase-in of requirements since 2009, and it began with the introduction of less permeable fuel hose. The new requirements call for hose with a maximum permeation rate of 15 grams per square meter (about a half-ounce for every 11 square feet) over a 24-hour period, a significant reduction. Outboard fuel hoses and primer bulbs are exposed to the sun’s ultraviolet light rays, dictating that these parts get replaced on a regular basis. With inboards, hoses out of sight are out of mind. When you replace, look for hose marked U.S. Coast Guard A-1-15. Beginning in 2009 for California and in 2011 for the rest of the United States, portable fuel tank makers and PWC manufacturers had to meet diurnal emissions requirements. For the portable fuel tank, this basically meant using new multilayer plastic formulas to reduce the fuel vapor permeability rate for the tank as well as re-engineering fill cap and vent setups on the tanks to reduce the potential for any leakage..
Fuel hoses and primer bulbs have also been re-engineered to meet the new requirements for lower permeability. One important note in this area is that most of the hose available with pre-fitted primer bulbs is B-1-15 rated, meaning that it is not fire rated and therefore should not be used in engine compartment applications as we sometimes see. Your marine boat parts professional knows that as for boats, either inboard or outboard powered with built-in fuel tanks, the new fuel systems not only need to control evaporative emissions, but they also need to integrate components to control fuel spit-back associated with refueling and to ensure that fuel can’t escape via the tank vent system when the boat is fueled or stored on an incline. Go to http://www.stainlessmarine.com/product-category/battery-boxes-accessories/ and see how you can find more information as well as get assistance on marine boat parts and on how to protect your fuel system at Stainless Marine. As for fuel tanks, builders have some options. Traditional aluminum tanks are one option and will require only modification to facilitate the mounting of some needed valves. I had a chance to inspect some samples of new plastic tanks that are certified to meet EPA requirements at a recent industry trade show. Moeller Marine Products, for example, had its tanks on display and described its plastic tanks as “bi-layer” plastic, with the inner layer being made of nylon. On my own 2012 outboard-powered center-console, I’ve inspected the entire fuel system in the year I’ve owned it. Aside from that, about the only noticeable differences are some small air bleed vents located on the inside of the fuel-fill cap and the presence of a carbon canister under one of the seats in the transom of the boat. The first fill-up of a new tank may cause the system to vapor-lock and shut off the fuel nozzle. If that happens, wait 10 minutes for fuel vapors to penetrate the whole system. Following that, this glitch should not reoccur. One thing you don’t want to do is try to get the evaporative control system bypassed or removed, or try to do that yourself. Remember too that all of the components for these systems need to be certified by the EPA and substitution with improper hoses, valves and canisters could end up causing more problems than you’ll be minimizing. So don’t forget these helpful points on how to protect your fuel system. 1) You aren’t going to have to do much of anything with your existing boat until you need to replace fuel lines; 2) Fuel hoses and primer bulbs have also been re-engineered to meet the new requirements for lower permeability; and 3) The first fill-up of a new tank may cause the system to vapor-lock and shut off the fuel nozzle. Click here and see how Stainless Marine has more information on marine boat parts and on how to protect your fuel system. Raritan Engineering Company your marine water heater experts want to share with you these topics we believed would be of interest to you this month pertaining to ways to handle your boat in challenging climate. This week’s idea from your marine water heaterspecialists is all concerning preparing on your own for heavy climate. If you have kept an appropriate hunt, developed a “watchful eye” and also checked the climate on your VHF radio, you ought to have plenty of time to obtain prepared. The following list was collected from various resources, your seaward marine hot water heater experts and from input from those that answered recently’s concern concerning “exactly what to do if hefty weather is coming close to.”. Boat Water Heater Experts Say This Is What Every Skipper Should Know. Determine placement of tornado, wind direction, speed as well as estimation time to your area. Protect all hatches; close all ports and also windows. (Keep the water outside.). Pump bilges completely dry as well as repeat as required. This assists eliminate “totally free water influence”, claims west marine warm water heaters experts. (Sloshing of water in the bilge as the boat rolls which could effect security.).
. Get an excellent fix of your location as well as story it on your chart. Make note of the moment, your heading and also rate. Make strategies to alter training course to sheltered waters ideally. You can locate more details as well as get assistance on boat water heater and on how to manage your boat in very difficult weather at Raritan Engineering. Prevent obtaining caught in hefty weather by creating a “peeled eye,” hearing your radio, as well as going to shore prior to it comes to be an emergency. Marine Water Heater Specialist Recommends Developing a “Weather Eye” to Avoid Getting Caught in Heavy Weather. Jack Lines – lines rigged along the outboard decks ranging from the bow aft. This permits you to attach the secure from your harness and move forward and back at will. Harness – a nylon web harness put on in harsh seas or hefty weather condition. It has a secure with a clip. Marine hot water heater installation suppliers claims that the clip is connected to the jack lines or lifelines so that if you are washed too far in a storm you are still connected to the boat. Sea Anchor – A drifting canvas cone, held open by wire rings, with an opening in the smaller end, and a rope bridle at the bigger end affixed to a line leading to the bow of the boat. It is used in tornado conditions to (a) keep the bow of the boat right into the wind, and (b) slow down the downwind drift of the boat. Do not forget these useful factors on just how to manage your boat in difficult climate. 1) Determine position of tornado, wind instructions, rate and also estimation time to your area; 2) receive all hatches; close all ports and also windows. (Sloshing of water in the bilge as the boat rolls which can effect stability.). Raritan Engineering has even more details on marine water heater, boat water heater, marine hardware, and on how you can manage your boat in very difficult climate. by means of Boating in Heavy Weather – Part 1. This helps get rid of “complimentary water influence”, states west marine hot water heaters experts. (Sloshing of water in the bilge as the boat rolls which can impact security.). Marine water heater installation providers states that the clip is connected to the jack lines or lifelines so that if you are washed over the top in a storm you are still attached to the boat. Do not fail to remember these useful factors on exactly how to handle your boat in hard weather condition. (Sloshing of water in the bilge as the boat rolls which can impact security.). Raritan Engineering Company your marine products professionals want to show you these topics we assumed would be of passion to you this month concerning watercraft docking tips. Your marine products experts recognize that we can not cover every little thing concerning boat docking in one sitting, however I assume you’ll be stunned at the amount of the standard concepts of close quarters handling are symbolized in the example docking which I will certainly be going over quickly. That brings up one more important factor. Learning how to marine dock is done on the water, in our watercrafts, not by reviewing it below. Reserve understanding and great training are essential, (I would certainly state critical), as well as enable us to concentrate our minds quicker and accurately compared to merely by utilizing the hit and miss approach. For today functions, I’m visiting presume tranquil marine conditions, as well as not aspect in the effects of wind. Wind is possibly the hardest point to emulate, when docking a boat. Go here http://raritaneng.com to see how your marine ice makers professionals understand that the very first thing to discover is that this seafarer is being available in at an angle. This makes it a lot easier to go for a particular spot, and to bring the watercraft in near the dock without scuffing. You can find more details as well as get aid on marine ice makers and also on boat docking suggestions at Raritan Engineering. Secondly, think of what throttle setting you would certainly utilize at the start of the technique. Nevertheless, drifting is when “steerage”, the ability to steer, goes to its minimum, since either i) there is no discharge current from the prop to enhance the impact of the tail, or ii) with inboard/outboards, many of the guiding “authority” merely fades away when the transmission remains in neutral. The following thing the seafarer will do, as the dock attracts nearer, is to begin to transform the boat. Nonetheless, this is likewise concerning the moment that he or she wishes to decelerate to a quit, backwards gear. While slowing down, the vessel might be tough to guide. Thankfully, watercrafts in activity have energy: once moving, they tend to proceed moving, and once turning, they often remain to transform. This often confuses the much less skillful skipper, but momentum is precisely what to make use of when all various other steering alternatives fall short, also for products acquiring experts. At merely exactly what point to turn, as well as just how hard as well as for how long, I can not say. One last point: it is very common for propellers to drive asymmetrically, a lot more on one side than the other, and also in some boats the effect is often specifically strong in reverse equipment. The appropriate marine products are likewise required to enjoy your taking a trip. It’s due to this result that we are reviewing especially port-side-to docking. Right-hand man propellers stroll the stern to port, backwards (a minority of propellers are “left hand” – for them, this entire discussion is a mirror picture). There is no final thought to watercraft docking or in buying the best products. I have yet to listen to the last word, as well as I’ve probably talked about as well as researched it greater than most. Even if this port-side-to docking were all there was to know (as well as it’s not, it’s simply the barest start), one could possibly still spend a lifetime sharpening and refining the skills and strategies it needs. Don’t neglect these practical points on discovering how to dock your boat. 1) Know your angle; 2) understand ways to deal with cruising and also the power turn; 3) maintain the momentum; and also 4) the stroll in the dock. Click here and see how Raritan Engineering has more info on marine products, marine ice makers, marine parts depot, and also boat docking pointers. Stainless Marine your marine performance parts professionals would like to share with you these topics we thought would be of interest to you this month regarding protecting your boat this winter. Your marine performance parts experts know that the coming of cooler weather means an end to the boating and motorcycling season for many. Chiefly important in preparing these vehicles for winter is managing the potential for engine damage from the federally-mandated ethanol blend in our nation’s gasoline supply. High performance marine engine parts professionals know that ethanol in gasoline stored for long periods can damage marine and motorcycle engines: “phase separation” of the fuel can leave a corrosive water-soaked ethanol mixture at the bottom of the gas tank. Your high performance marine parts know that half of the respondents of a recent Boat Owners Association of The United States (BoatU.S.) survey reported that they have had to replace or repair their boat engine or fuel system parts due to suspected ethanol-related damage, costing an average $1,000 for repairs. You can find more information as well as get assistance on high performance marine parts and on how to protect your boat this winter at Stainless Marine. To prevent ethanol problems or performance marine problems over the winter, boats with built-in gas tanks should have fuel stabilizer added and the tank left nearly full. But the Environmental Protection Agency ignores the public’s concerns and continues to increase the amount of ethanol required to be blended in our nation’s gas. Even though it’s illegal to use E15 (15 percent ethanol by volume) in marine engines, snowmobiles, motorcycles, lawnmowers, and any vehicle made before 2001, E15 can now be found in 24 states. 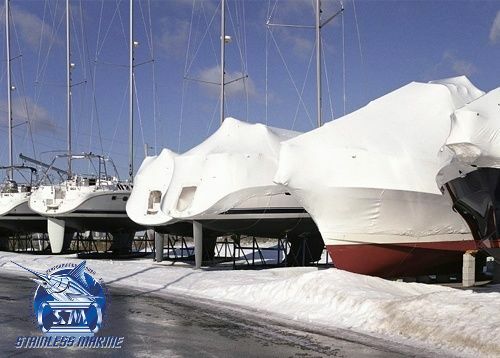 So don’t forget these helpful suggestions and tips on how to protect your boat this upcoming winter. 1) Remember that preparing your vehicles for winter is managing the potential for engine damage from the federally-mandated ethanol blend in our nation’s gasoline supply; 2) Ethanol in gasoline stored for long periods can damage marine and motorcycle engines; and 3) in addition to winter storage and engine repair concerns, ethanol-blended fuel is actually worse for our air and water. Stainless Marine has more information on marine performance parts, high performance marine parts, outboard engine brackets, and on how to protect your boat this winter. Raritan Engineering Company your boat water heater specialists would like to share with you these topics we thought would be of interest to you this month regarding how to protect your boat from lightning strikes. Your boat water heater experts know that this spring seems to have brought the most extreme weather in history. With heavy thunderstorms you will often find lightning. Lightning on the water can bring life-threatening circumstances. Even though the odds are in your favor that your boat may never be hit by lightning, if it happens it can have devastating effects. Boat water heater installation experts say, don’t take a chance, protect yourself. If you are in a small boat and close to shore when a thunderstorm approaches, get in and off the water immediately. Better yet, don’t go out if thunderstorms are predicted. Your marine hardware professionals know that the voltages involved in lightning are so high that even materials that would normally be considered non-conductive become conductors, including the human body. You can find more information as well as get assistance on marine hardware and on how to protect your boat from lightning at Raritan Engineering. Several marine water heaters for boats analysts agree that the voltages are so massive that if they start to travel through a boat’s structure – say through its mast – then meet with high resistance (for instance, the hull skin) the current discharge, in its attempt to reach ground, may simply blow a hole in the non-conductive barrier. In theory, a lightning protection system is used to create what is know as a “Faraday’s cage,” so called after the late nineteenth-century scientist Michael Faraday. The principle of a Faraday’s cage is to provide a surrounding, well-grounded, metal structure, in which all of parts are bonded together and carry the same electrical potential. So how does a lightning protection system work? In a boat, the “cage” is formed by bonding together, with heavy conductors, the vessel’s mast and all other major metal masses. A marine electrician must tie in the engines, stoves, air conditioning compressors, railings, arches etc. with a low resistance wire which would ultimately provide a conductive path to ground (the water) usually via the engine and propeller shaft, keel bolts, or better yet, a separate external ground plate at least 1 square foot in dimension. Boat water heater connectors specialists know that this means that if the aluminum mast of the average sailing vessel is properly bonded to the vessel’s other major metal masses and is given a direct, low-resistance conductive path to ground, the entire boat should fall within the protected zone. So don’t forget these helpful pointers on how to protect your boat from lightning strikes. 1) If you are in a small boat and close to shore when a thunderstorm approaches, get in and off the water immediately; 2) an even better tip, don’t go out if thunderstorms are predicted; and 3) put forth the time and effort into making your lightning proof system. It will be worth the effort. Raritan Engineering has more information on boat water heater, marine hardware, marine water heater, and on how to keep your boat lightning proof.